Scroll down to see a variety of Christmas gifts under $200 and details about our first annual Suds & Shop Guys Night Out. Multi-color cross, thick textured acrylic painted on reclaimed wood by Holly Rhodes. Beautiful scene of the Gulf of Mexico, thick textured acrylic painted on wood by Eddie Powell. Cross made of recycled glass and resin on pearlized white painted canvas by Mary Hong. A great guest book or journal to record memories of your vacations, with beautiful images compiled by Eleanor Lynn Nesmith. The 30A Coloring Book is for adults and kids who love 30A and those who dream of visiting. Multi-color arrow made from vintage soda cans on reclaimed wood by The Moore Family Folk Art. Yellow and orange flip flops on turquoise background. Fun and whimsical acrylic with resin on canvas by Sherri Billgham. This sweet angel comes in 3 soft color choices: blue, taupe or gray. Heavy acrylic on wood by Eddie Powell. Tricia’s iconic bike has become highly saught after by lovers of 30A and The Blue Giraffe over the years! Pink flip flops on turquoise background. Fun and whimsical acrylic with resin on canvas, by Sherri Billgham. Our signature blue giraffes are so precious in this piece! “You are so loved” acrylic on canvas by Linda Fisher. Let us be your personal shopper. Unique gifts for your loved ones. 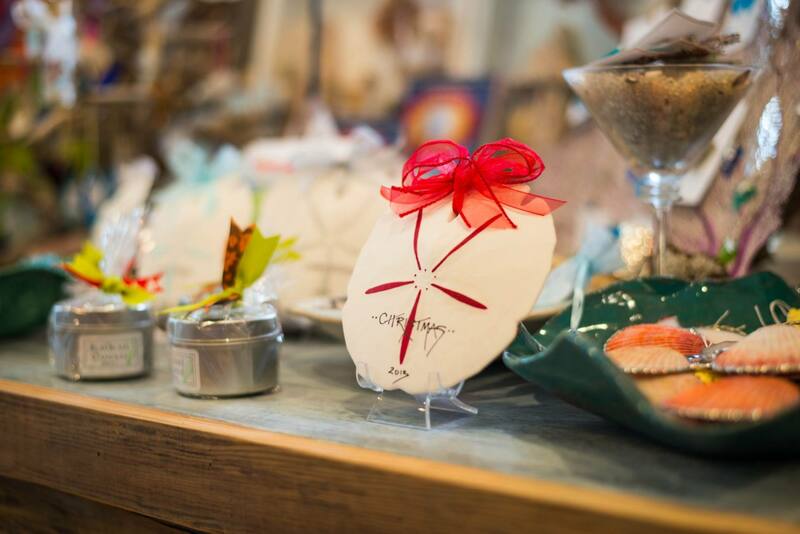 Send your sweetie in ahead of time to make a wish list! Free beer, in case we forgot to tell you! The Blue Giraffe now carries a unique selection of art supplies including acrylic paints, sketch books, canvases and more! The Blue Giraffe family wishes you and your loved ones a very Merry Christmas and a joyous New Year!